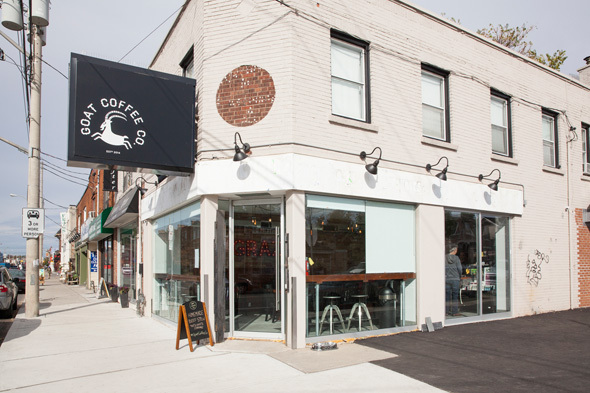 Goat Coffee Co. has been, as its Twitter states, "kinda sorta open" for a little over a week in Pape Village . 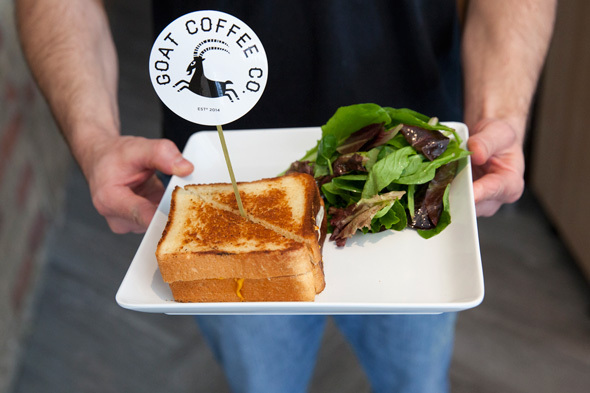 Occupying what used to be a Cash for Gold, its name is based on a legend that coffee was first discovered by goats . 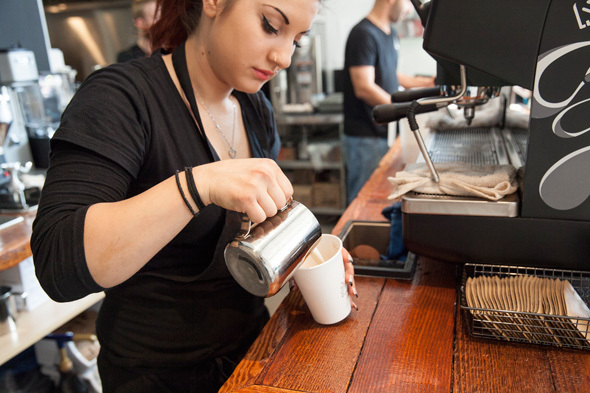 Owners and proud East Yorkers Anna and Damian Michaelidis surveyed locals about what they wanted in the space (their responses were generally, "anything but a Cash for Gold"), and decided the area needed a friendly neighbourhood coffee house. 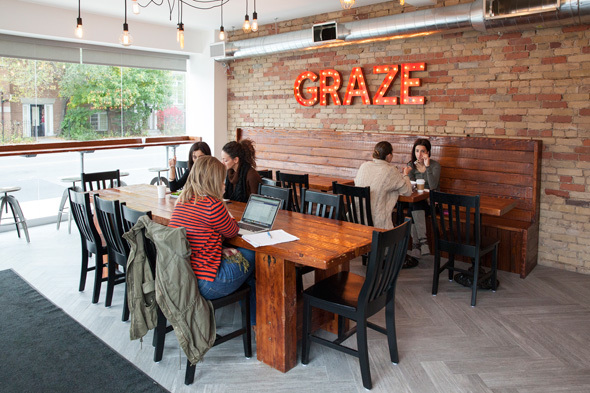 Hanging Edison bulbs, reclaimed wood from a whiskey distillery that Damian has transformed into tables and benches, exposed brick, and eye-catching salvaged marquee letters that light up and spell out "GRAZE" are pretty standard decor for indie cafes these days - but arguably atypical for this part of town. It's a pleasant place to hang out, use the free WiFi and get work done (a year-round side patio is also in the works). There's a respectable java-serving setup with a Mazzer grinder, a Nuova Simonelli espresso machine and beans from Toronto roaster Rufino . A perfectly likeable latte can be had for $3.50 for a single shot, or 50 cents more for a double. Reverse-osmosis water offered on tap is a considerate bonus. 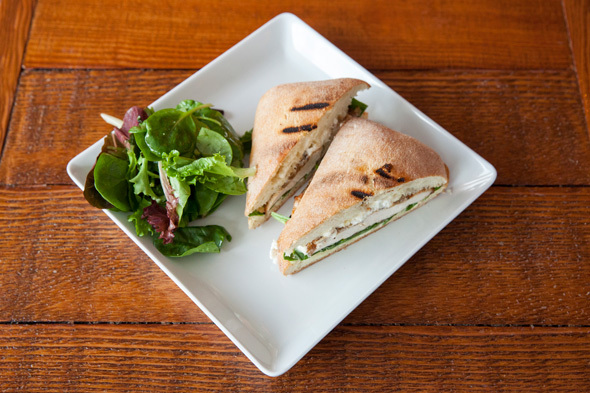 With a dearth of of healthy food options on this strip, the Michaelidises recruited chef Akis (Ike) Tzakis to make salads, soups and sandwiches in the cafe's back kitchen. 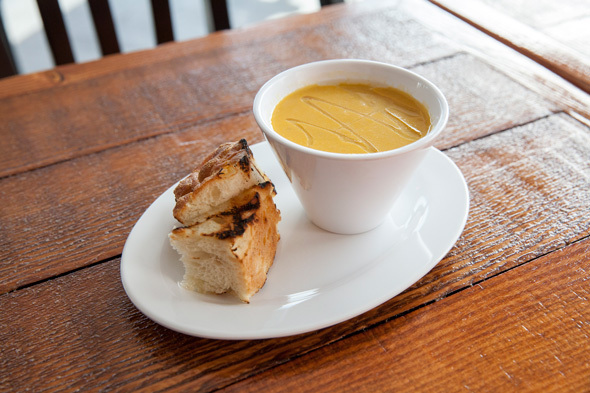 A bowl of lentil soup ($6), served with fresh bread, accompanied by a grilled chicken breast sandwich with caramelized onions, garlic aioli, havarti and spinach on a ciabatta ($9) are just what's needed on a cold and dreary fall day. 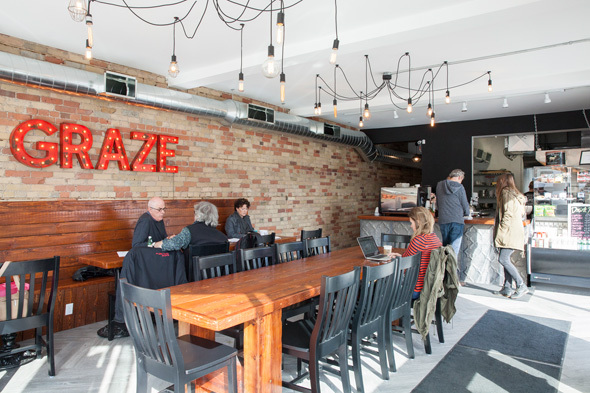 In keeping with the theme of healthier options, other offerings include gluten-free, nut-free baked goods from Queen B Pastry as well as cold-pressed juices and nut milk from Forbidden Fruit . Anna, who also works as a real estate broker down the street (she sold this cafe space to the current landlord), and her husband have pretty much created the ideal lunch/coffee-break spot for herself and her co-workers, and by the warm welcome it's received, it seems the rest of the neighbourhood is glad they did. Photos by James C. Lee .